A high-definition version of the classic movie-musical debuted at the TCM Classical Film Festival. 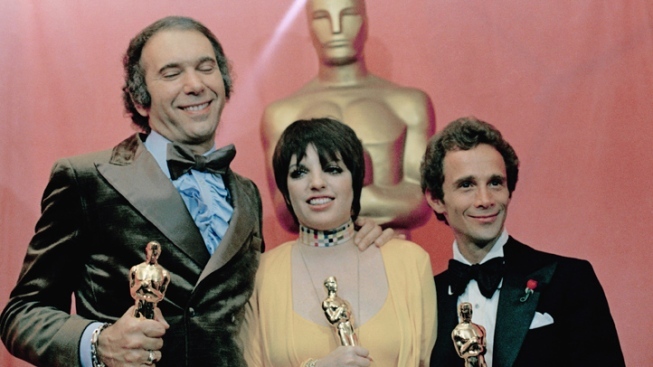 Liza Minnelli, holding her Oscar for Actress in a Leading Role, poses wtih Joel Grey, at right, who won for Actor in a Supporting Role, both appearing in the film "Cabaret," at the 45th Academy Awards show on March 27, 1973. At left is Albert S. Ruddy, producer for "The Godfather," which won the Best Picture award. It took a stray bit of dirt to scratch the perfection of "Cabaret," and painstaking effort to return it to cinematic glory. The restored "Cabaret," minus damage that had prevented a high-definition version, debuted Thursday at the opening of the four-day TCM Classic Film Festival. Stars Liza Minnelli, Joel Grey and Michael York were cheered by fans at the Grauman's Chinese Theatre ceremony marking the musical's 40th anniversary. Minnelli, whose turn as cabaret singer Sally Bowles captured a best actress Academy Award and cemented her young stardom, said making "Cabaret" was a joyful "secret," filmed in Munich and far away from meddling Los Angeles studio bosses. Director Bob Fosse "got away with murder. We all did," Minnelli said in a recent phone call from New York. She's on a concert tour, "Confessions," based on her album of the same title. "We'd take chances, and the studio would send notes like, 'Too cloudy. It will break up on drive-in (screens),'" she recalled. "Fosse would read that out loud, tear it up and throw it over his shoulder — in front of the whole cast and crew." Set in 1930s Berlin, with German life darkening under the Nazi Party's rise, the film was based on the 1966 Broadway musical adapted from Christopher Isherwood's short novels. York starred as Sally's boyfriend and Helmut Griem played the wealthy lover shared by both in a then-rare movie depiction of bisexuality. Fosse's distinctive, archly suggestive choreography defined the film's candor and cynicism. Grey portrayed the grotesquely painted master of ceremonies at the nightclub where Sally performed. Her vulnerability and yearning were on display in the tawdry setting as she belted out "Maybe This Time," ''Life Is a Cabaret" and other indelible songs from the John Kander-Fred Ebb score. Grey also won an Oscar, for supporting actor (he earned a Tony Award in 1967 for the role). Besides capturing a total of eight trophies, including best director for Fosse, the 1972 film was nominated for best picture. Thomas S. Hischak, professor of theater at the State University of New York College at Cortland and author of "The Oxford Companion to the American Musical," said he routinely shows clips from "Cabaret" to his students. "It hasn't dated. It really was exceptional," he said. "The movie 'Cabaret' is totally different from the play, and it's just as good. They took one masterpiece, radically changed it, and came up with a film masterpiece." "Cabaret" has been sold on standard-definition DVD from Warner Bros. But it was unavailable in high-def or for digital presentation because of a vertical scratch that ran through 1,000 feet, or 10 minutes, of one of its reels, said Ned Price, vice president of mastering and restoration for Warner Bros. The damage apparently was caused by a piece of dirt that had rolled through the length of the reel, starting with a scene in which York's character has a confrontation with a pro-Nazi boarding house resident, and cut into the emulsion. With the damaged images digitally "painted out" using bits from surrounding areas, "the difficult part was matching the grain structure so the fix was invisible," Price said in an email. Repair attempts using automated digital processing failed, so all 1.4 million frames of the damaged reel were painted by an operator using a computer stylus. The restored version is expected to play on TCM later this year. For Minnelli, 66, "Cabaret" holds a certain family irony: It reversed an approach to movie musicals she said was pioneered by her late father, famed director Vincente Minnelli, in a 1944 film starring her mother, Judy Garland. The actress-singer and Vincente Minnelli were married from 1945-51. Garland, 47, died in 1969. "My father changed everything when he did 'Meet Me in St. Louis,'" Minnelli said. "That was the first time a musical had taken the songs outside of the theater, and people sang at home and on the street." "'Cabaret,'" she said, "changed it back," with Fosse staging nearly all the musical numbers in the nightclub setting. An exception: "Tomorrow Belongs to Me," sung by a handsome, innocent-faced teenage boy, who as the camera pulls back, is chillingly revealed to be garbed in a Nazi uniform. Her dad had a role in how she approached her character's style, the actress said. When she sought inspiration from the sleekly elegant look of Marlene Dietrich, who was famous in the 1930s (and beyond), Vincente Minnelli protested. "My father said, 'No, no, no,' and he showed me pictures of (actresses) Louise Brooks and Theda Bara. He said they were marvelous brunettes," she recalled. The result: Sally's heavily lined, thickly lashed eyes, defined lips and a sleek cap of black hair with an impish — devilish? — point extending down her forehead. Two days before shooting began, she put the look together for Fosse's benefit. "I knocked on his door and said, 'What do you think?'" Minnelli recalled. He gave a surprised stammer, she said, followed quickly by, "It's good!" How does Minnelli, one of the few artists to win an Oscar, a Tony (her first was at age 19, for "Flora, the Red Menace"), an Emmy and a Grammy, feel about being so closely identified with "Cabaret"? "Honey, to tell you the truth, anything anybody says is fine," she said, adding a husky, hearty laugh.